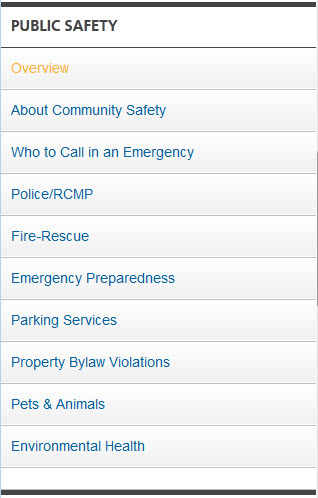 Welcome to the City of Richmond website. We have made every effort to organize the site to allow you to easily navigate both the interactive services and reference information available. This site can be viewed on most mobile screens. 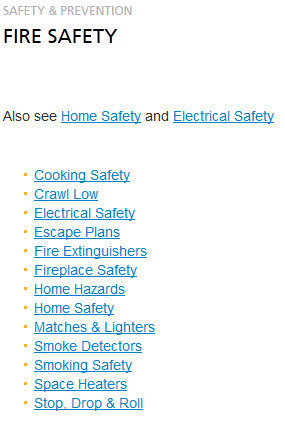 The Home page introduces you to the main content categories, as well as several tools designed to help you find information, all of which are described in this help page below. We hope you enjoy exploring Richmond's website. If you have any questions or problems, please use the Customer Feedback form to comment, or call our Information Desk for assistance. 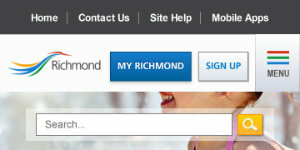 For assistance with MyRichmond, please visit our MyRichmond Online Help site. The Main Site Menu opens to the right when you click the Menu icon at the top right of every page on the site. This menu allows you to move to the main sections of the site. It will close automatically if you click on one of the topics. If you wish to read further on the page you are on, you can close this menu by clicking the Menu icon on the left corner of this fly-out. See image below. The Home Page has a utilities menu bar above the main navigation at the top of the page (see image below). 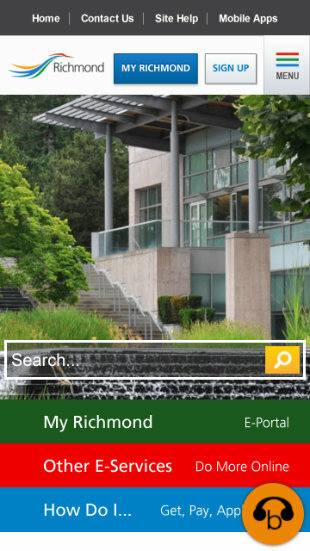 You can return to the home page from any content page by clicking the Home link in the utilities menu at the top of the page or by clicking on the Richmond logo on the secondary utilities menu. Note that the background photo may have changed if you return to Home during your visit. The footer menu provides useful links to popular topics and useful tools and information as well as links to our social media sites. Click on the Main menu icon to close the fly-out. 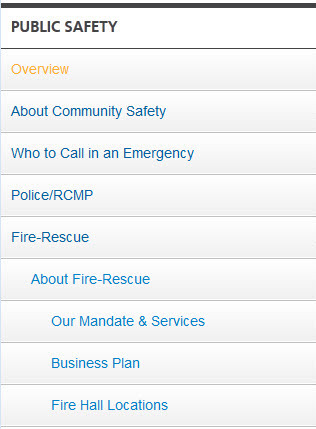 Also note the topics with bright coloured icons are about the Community and Community Recreation and Cultural Services. The topics with soft grey icons are about City business and City services. Some key footer links for social media and subscriptions appear on both the Menu as shown above and the page footers shown below. As you scroll down the content area in Content Pages and the Home Page there is a more complete list of footer links for social media and subscriptions and links for popular and useful topics. Note the City's address and hours of operation are also noted in the footer. Also, on Content Pages additional drop downs with helpful Quick Links will appear above the footer. Click the down arrows to open the drop list to explore these links. 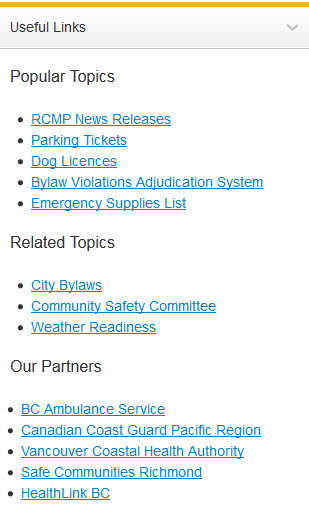 News Highlights and a link to the News & Events Section with more new releases and notices. Events coming up and a link to the Calendar of Events and Add an Event features. Featured Topics with information on current City projects and activities of note. Like on the Home Page on content pages the main menu can be opened with the Menu Icon. Note that the first background photo will change if you return to Home during your visit. When you click on the "Menu" link, the list of main categories will fly-out to the right and to close it you click the Menu link which will now be on the left corner. When you click on a main category link in the main menu you will open a new content page that displays the main menu and the introduction to that section of the website. The Overview page will also display a link to the site map for that section. Immediately below the content you will see three drop lists with links to Popular Topics in this section, Related Topics in this site, and Related Links to other sites. Scroll down below the page content and past the Content Section Quick Links to locate the sub-navigation menu for the section you are viewing. Tap one of the subjects in the menu, and you will see any additional menu levels. Click to display the item you want to view. 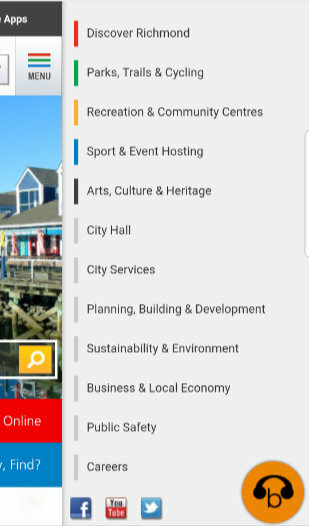 Tip: As these menus are sensitive on mobile devices you may find it easiest to click the first category to open a site map for that sub-section. See the 3rd and 4th image below. In some cases more topics available for an area than fit on the fly out menus, in this situation an in-page menu is displayed. 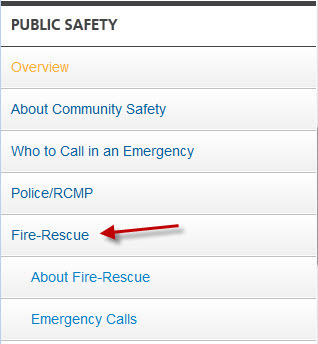 For example, in Public Safety, if you used the accordion-out menu to select Fire Safety (under Fire-Rescue, Safety & Prevention) several topics are available as shown following. The navigation trail (just below the Search Bar) shows specifically where you have navigated to. Items listed on the navigation trail are links. On the navigation trail, clicking the link for the main page (in the section you are viewing) displays the site map (link to Site Map help). To display the overview for the section, click Overview on the Navigation Menu after the Useful Links portion of the page. You can perform a keyword search from any page (including the Home Page). Simply click to position the cursor in the box at the top right corner of the page, then type your keyword(s) and click the magnifying glass icon. (Or press 'Go' on your device's keyboard). A results list is displayed. Click the link for the item you want to view, or click the browser's back button to return to the previous page. The Site Map provides a comprehensive list of all items available in the content category you are viewing (or the entire site). To view the site map for an individual category, display the category's Overview topic, then click Site Map in the gray tip bar (towards the bottom the page). To find the site maps for the entire site, click the Site Map link in the footer at the very bottom of any page.